From the well-established Periscope to the latest entries of Facebook and Instagram Live, live video has entered the mainstream. If your brand is looking to partner with an influencers in a live stream collaboration, chances are you’ll be able to do it on the social platform of your choice. And if you’re looking for inspiration, you’ve come to the right place. In this article, we review ten examples of effective influencer live stream promotions and dive into why they worked. Mashable partnered with America's Test Kitchen and chef David Vos to launch a cooking show that was filmed using only a camera phone and streamed live on Periscope. 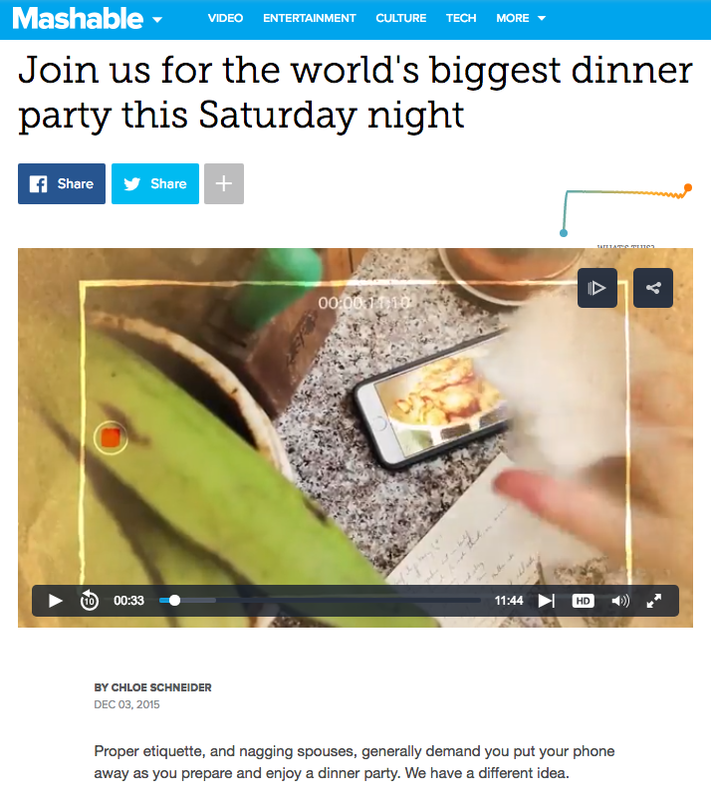 Touted as the “world’s biggest dinner party,” the publisher leaned into the popularity of how-to tutorial videos, while applying the excitement of live video to a genre that’s traditionally pre-taped. Mashable drummed up interest ahead of time by promoting each episode on other channels, including tweets, Facebook events, and their own website. 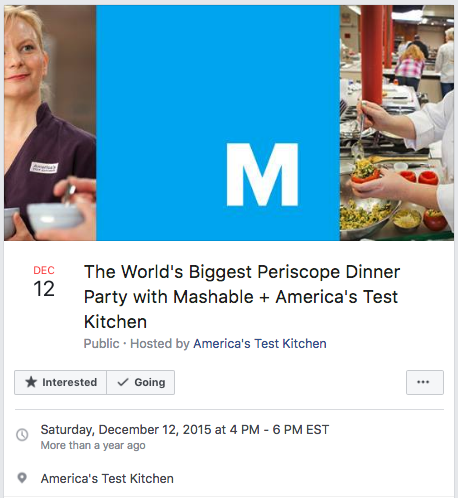 Once they were live, representatives from both Mashable and America’s Test Kitchen were on hand to answer user questions on Twitter and Periscope and help boost the video’s discoverability. What other brands do your influencers work with? Consider whether you can all collaborate together for extra manpower and increased visibility. 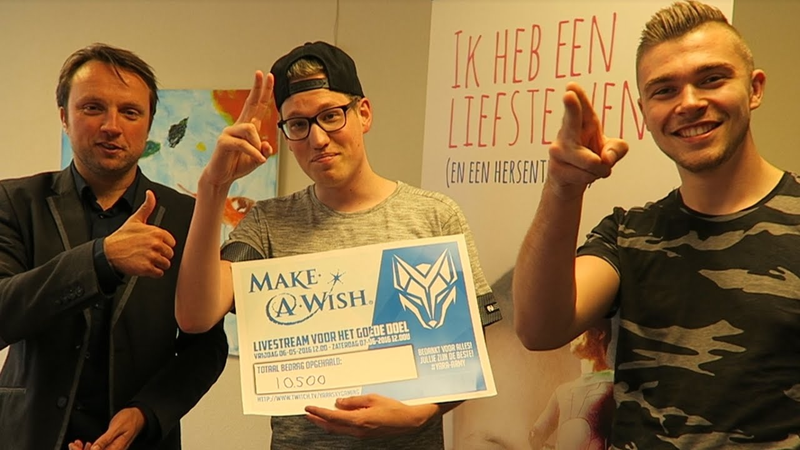 The Netherlands branch of Make-a-Wish collaborated with gaming vlogger Yarasky for a livestream telethon, proving that influencer marketing works for non-profits, too. During his 24-hour YouTube Live video, they raised over 10,000 euros, and reached nearly 6 million people, earning tons of publicity in the process. 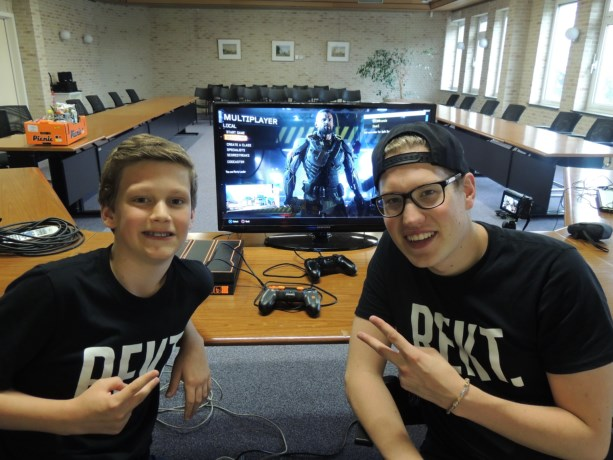 Plus, one lucky kid had his wish granted: to play Call of Duty with Yarasky. This kind of campaign is a win-win: your brand gets rich while the influencer gets to give back. Find influencers who care about the causes your organization supports, and host a livestream fundraising event together. This next one’s another video gaming example, but the implications apply to any consumer products company who wants to take a creative spin on the unboxing video genre. 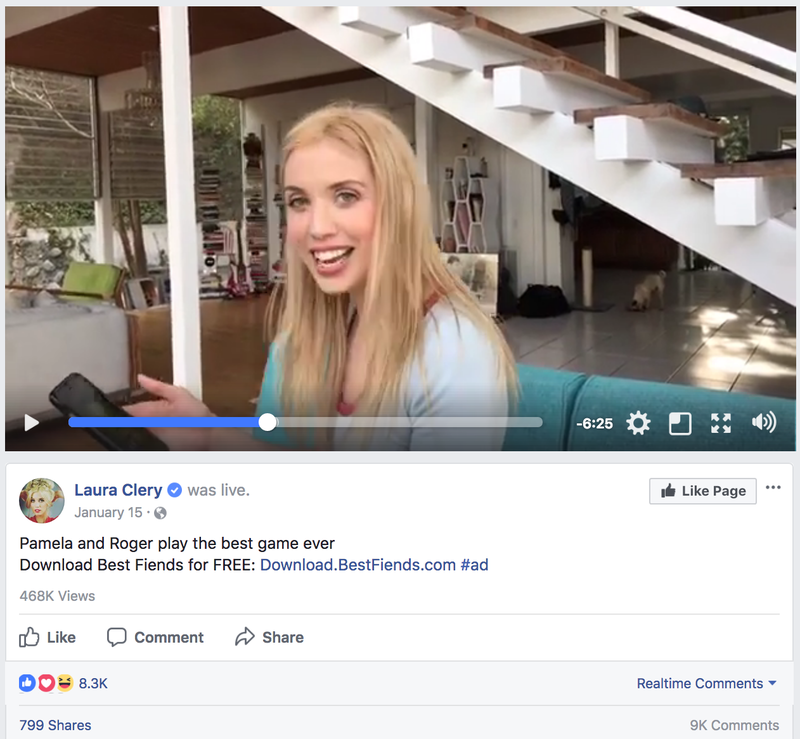 As a social gaming app, it made sense for Best Fiends to promote the app’s release on the biggest social platform, Facebook, with a popular social influencer like Laura Clery. Laura infused the video with her characteristic humor, by playing the Best Fiends game in the the spirit of one of her more popular characters “Pamela,” while her husband also made an appearance to play alongside her. To date, the video has racked up 468K views, 800 shares, and over 9,000 comments. Live social video makes product unboxing videos even more exciting. Partner with influencers to unpack your latest software updates or newest products via livestream. 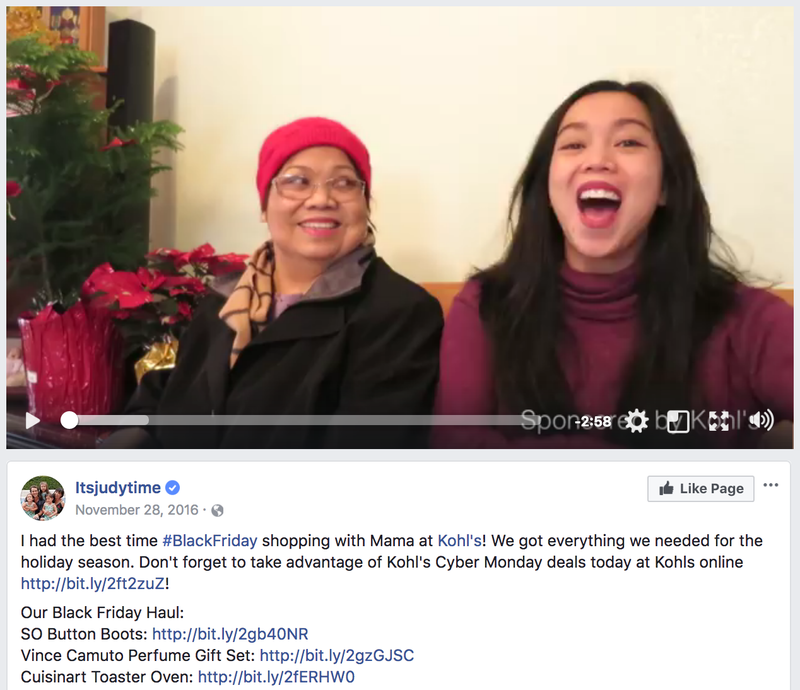 Kohl’s partnered with vlogger ItsJudyTime to promote their Black Friday sales on Facebook Live. Judy took her mother on a Black Friday haul, during which they discussed how easy it was to get everything in one store. Then, Judy posted it to her page to drive additional traffic throughout the holiday sales weekend. In the description, she included links to all of the products they purchased and reiterated the amazing Cyber Monday deals her viewers could score at Kohl’s. The video has earned nearly 200,000 views to date. Sales are exciting for your customers: they’re available for a limited time only, so they have to rush if they want to enjoy the savings. Up the ante by showing influencers taking your hottest items off the shelves in real-time. With their Drumstick Periscope campaign, Nestle did a lot of things right. First, they took advantage of an already trending topic: #FirstDayOfSummer. The day before, they heavily promoted that they would be going live on Twitter. 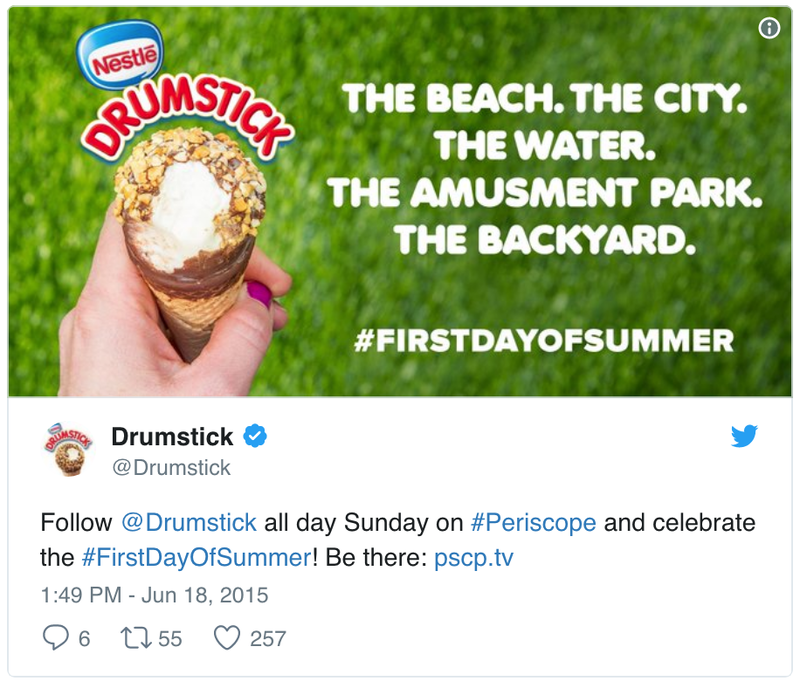 Then, they filmed their own Periscopes throughout the day featuring the Drumstick alongside classic summer activities like playing frisbee in the park. 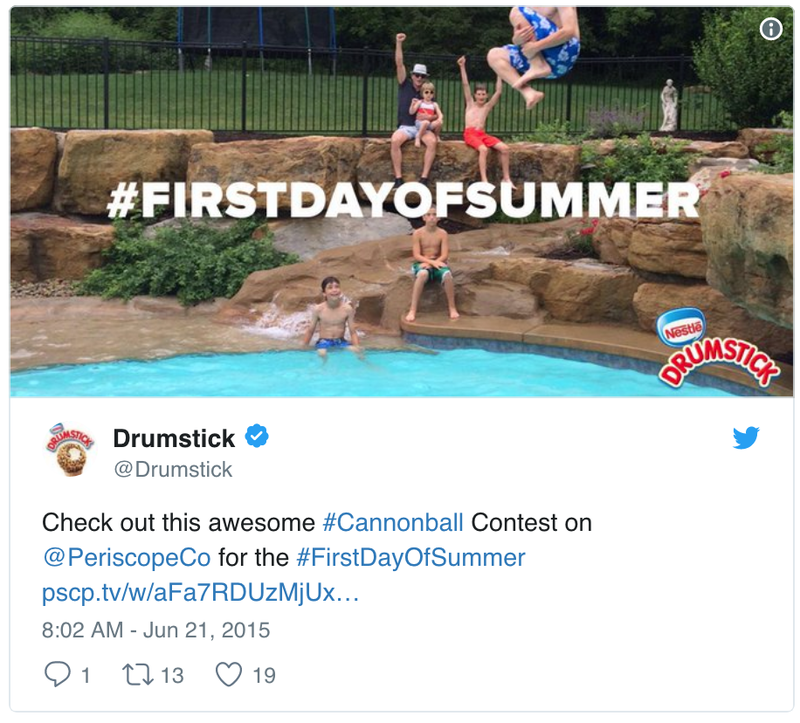 Finally, they partnered with influencers (like entrepreneur Olga Kay) across the country to film their own favorite summer activities while enjoying a Drumstick. It’s easy to see how the campaign went viral. Collaborate with multiple influencers on a single campaign to boost your video’s chances of getting discovered. Sometimes it’s as easy as hosting an AMA with a popular influencer. 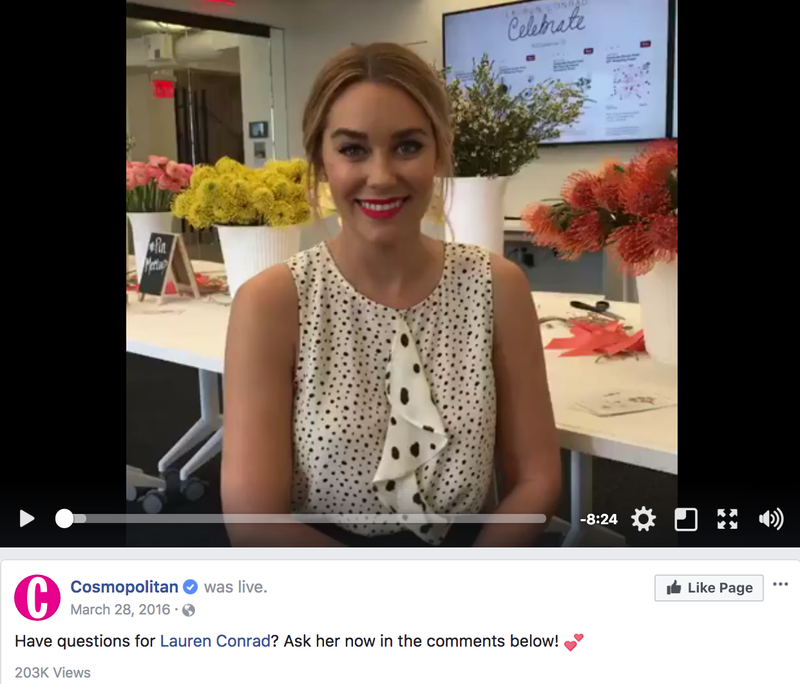 Cosmopolitan magazine took this approach with reality-star-turned-designer Lauren Conrad. Lauren was promoting her latest book, so she was happy to announce it to Cosmopolitan's huge fan base. Meanwhile, Cosmopolitan’s Facebook fans got another reason to keep subscribing to the brand: exclusive interviews with their favorite influencers. If you don’t have the budget for a huge celebrity like Lauren, you can still enjoy the success of this technique. 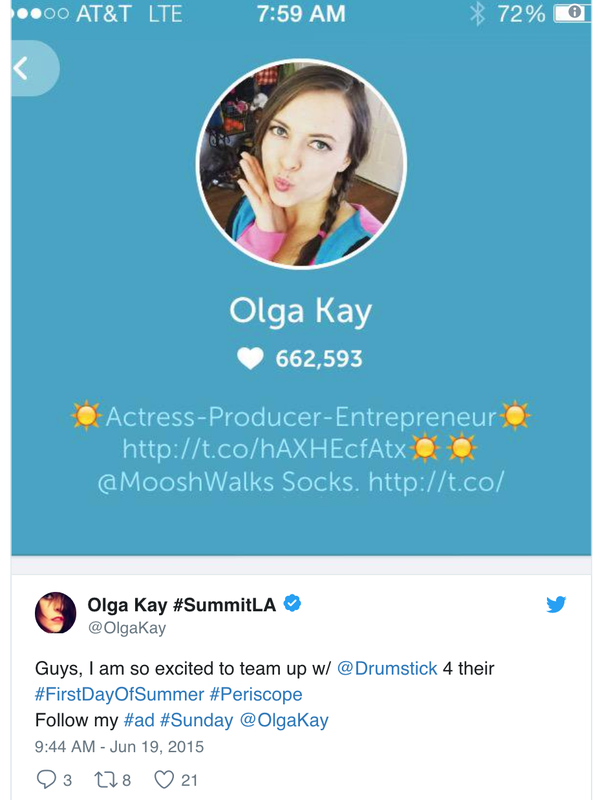 Look to the people who are famous within your niche: the bloggers, [local celebrities](https://dealspotr.com/article/local-influencers), and industry movers and shakers. 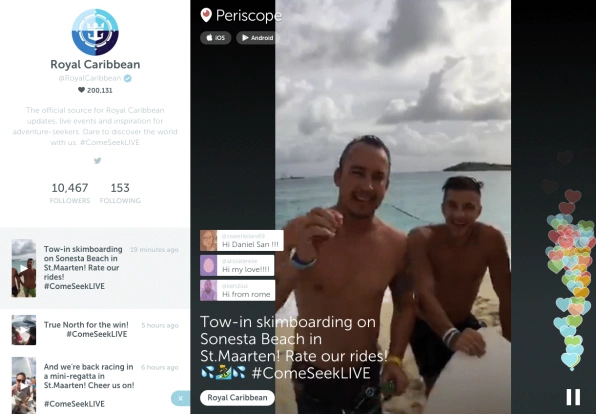 Royal Caribbean ran a weeklong Periscope campaign, following travel influencer Dan Moore as he broadcasted live from five destination islands. 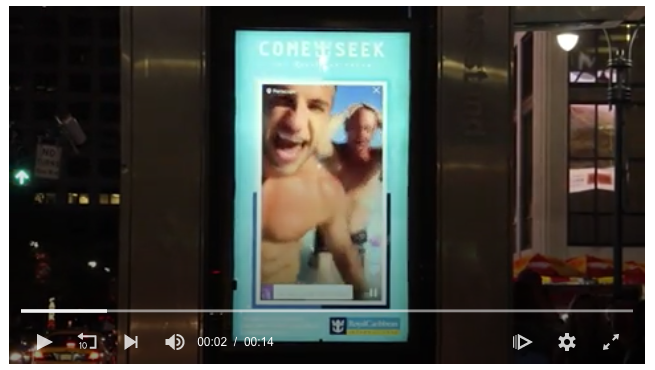 Then Royal Caribbean streamed the live streams across port city New York billboards, encouraging more Periscope users to turn in, while increasing their view counts and brand awareness among non-users. Royal Caribbean’s goal was to reintroduce themselves to millennial consumers and show that they weren’t your average cruise line. Mission accomplished. Influencers introduce your brand to a whole new world of fans. Consider how influencers can help you break into new demographics, regions, or industries. With its visual focus, Instagram has always been a hub for anyone who loves fashion. Over 200 million people follow fashion accounts on Instagram. During New York Fashion Week, fashion designers film behind-the-scenes footage, livestream the runway, and interview their top models. The smart ones also work with influencers to amplify their reach. 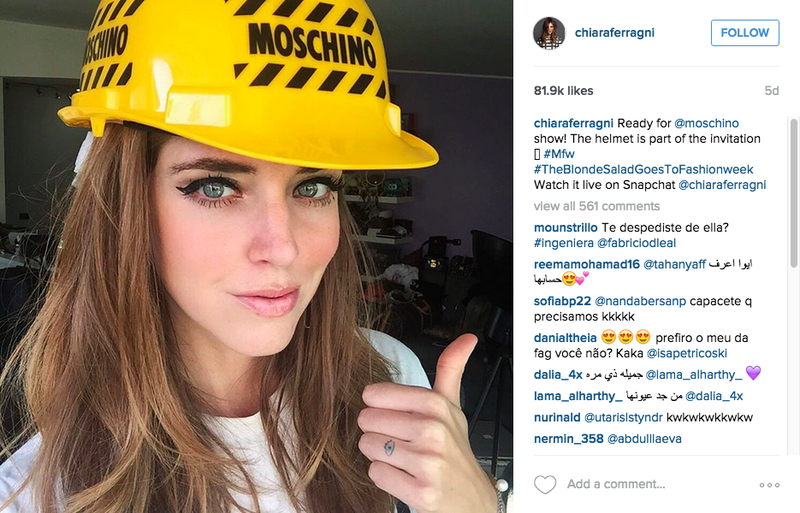 Fashion influencer Chiara Ferragni partnered with Moschino, Instagramming ahead of time to encourage her followers to watch her attend their runway show live on Snapchat. Does your brand attend tradeshows and conferences? Don’t get lost in the fray. Have influencers livestream from your booth to drive traffic your way. 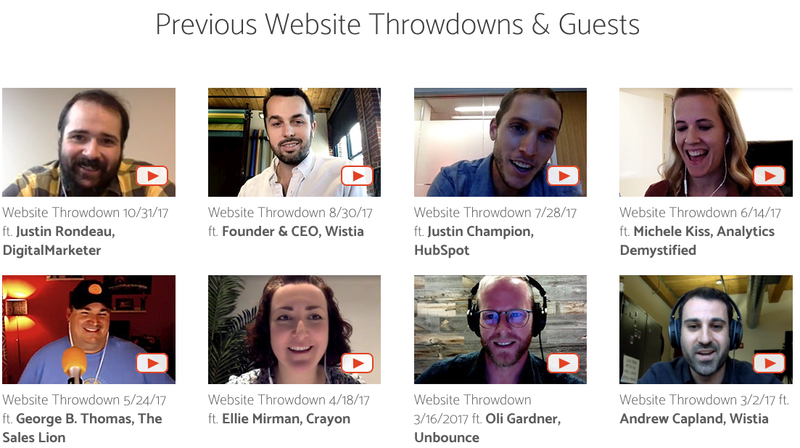 Marketing agency IMPACT hosts a monthly “Website Throwdown” series on YouTube Live. The company’s CEO and Chief Strategy Officer are joined by an industry influencer to analyze websites live on YouTube. The series presents IMPACT as subject-matter experts: not only do they know their stuff, but they’ve earned a stamp of approval from others in the industry who do, too. Fans ask questions about their own websites, and get answers from the experts and other viewers, driving discussion and boosting discoverability. The predictability of hosting it every month encourages fans to stay connected and tune in regularly. Once the livestream is done, IMPACT posts the videos to their YouTube and their website for long-term SEO benefits. Create another customer touchpoint with a regular livestream series. Collaborate with various influencers to drive attendance. 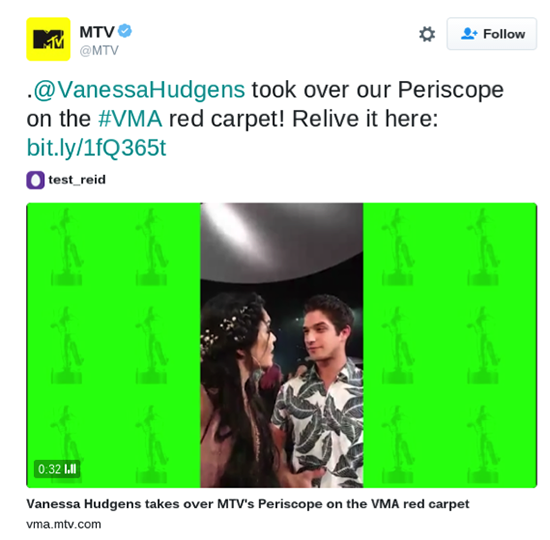 MTV figured they’d be a good fit for livestream, too, which is why they invited actress Vanessa Hudgens to take over their Periscope channel live from the red carpet at the VMAs. These livestreams drive viewership on the big screen and discussion on the small screen, which leads to more viewership back on the big screen. Livestream is all about being genuine. Behind-the-scenes footage at your company can feel promotional when you’re the one driving the camera. Let your influencer take your customers backstage on livestream, and it will feel more real. From fundraising to product launches to events coverage, live streams offer brands another avenue for influencer marketing. Use the unique advantages of live video - immediacy and authenticity - and your customers will have fun, while your brand enjoys success. 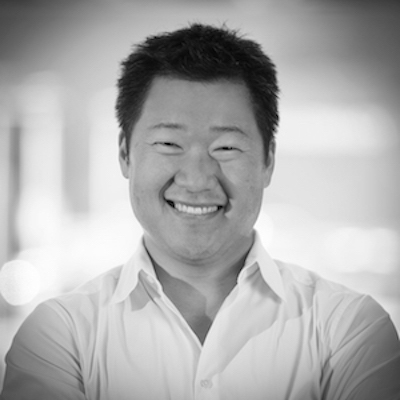 Michael Quoc is the founder and CEO of Dealspotr - an open social network helping trend-seeking shoppers find today’s best deals & allowing new and established brands to run sponsored campaigns with micro-influencers in their niche. Previously, Michael spearheaded the launch of several innovative live video and mobile social networking services as the Director of Product Management for Yahoo's media lab. He has been awarded nine patents in both mobile and social network apps and technology fields. Follow Michael on Twitter at @michaelquoc.